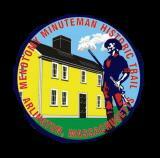 Created as a Scout project, the new Menotomy Minuteman Historical Trail guide tells the exciting history of Arlington, Massachusetts, the site of the most fighting and bloodshed on the opening day of the Revolutionary War, April 19th, 1775. You can bike or walk the Trail past many important historic landmarks, such as the Jason Russell House, the Old Schwamb Mill, and the Uncle Sam Memorial. At roughly the halfway point along the trail, walkers stop at the Foot of the Rocks, where the largest engagement occurred as over 1,500 British troops were ambushed by colonial militias from all over Massachusetts at the start of the Revolutionary War. The 4-mile Trail follows a loop that begins and ends at the Jefferson Cutter house in Arlington Center. It is designed for self-guided walking tours for anyone interested in American history, including families, school groups, and Boy Scout and Girl Scout units. Parking is available in the municipal parking lot in Arlington Center. Anyone interested in walking the Trail should dress for the weather and wear comfortable, supportive shoes. For those unable to complete the entire loop, there are opportunities to return to the starting point via MBTA buses. You can download the Trail guides on-line, or pick up a printed copy at the Jason Russell House, the Jefferson Cutter House, the Old Schwamb Mill, or the Robbins Memorial Library. For more information, feel free to click here to contact the Arlington Boy Scouts. Gather with the Day Tripper Divas! Editor’s Note: We recommend getting to Wingaersheek early or late for close-in parking ($20 weekdays; $25 on weekends; $15 after 3; free after 5), or bring an extra adult for dropoff so small children don’t have to walk too far. 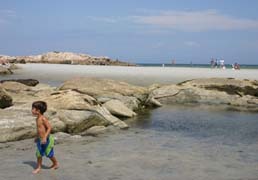 Explore Hundreds of Family-Tested Destinations in The Compleat Day Tripper Boston & Cape Editions! Explore 350 Great Destinations in The Compleat Day Tripper! The Harbor Islands make a great day trip out of Boston Harbor Tours at Long Wharf. The boat ride itself is a blast, and George’s Island offers tours of Fort Warren, an old stone fort that’s fun to explore, with lots of paths to walk on and open areas to run around (wear shoes and dodge the goose gifts).There are tons of fun kid-friendly things to do on many of the Harbor Islands and at Hull. Nantasket Beach on the Hull peninsula is a favorite, but be advised that the boat landing in Hull does not really get you very near the beach, though there are taxis. The Day Tripper Divas have teamed up with Google’s Feedburner (below). Get the widget for your desktop, and you’ll see all the updates the minute they are posted! Editor’s Note: Perpetual Motion now offers areas for school-age kids as well as pre-schoolers, plus they offer a coupon for Dispatches subscribers. Please visit our sponsor site to claim your discount!